Diamond Microdermabrasion is a holistic option for modern skin care and is suitable for all skin types. It takes a simple approach to impart healthier, younger-looking skin to women and men across different age groups. Microdermabrasion is a gentle method of exfoliating the skin’s surface with natural Diamond Head. Safe and effective, it loosens dead skin cells and clogged pores by enabling a controlled removal of epidermal layers at varying depths with virtually no side effects. It helps diminish the appearance of acne, fine lines, hyper pigmentation (dark spots) and sun damage. Simultaneously, it induces collagen stimulation and promotes the production of new cells in the basal (deepest) layer of the dermis to give the skin an overall healthy- looking, radiant glow. 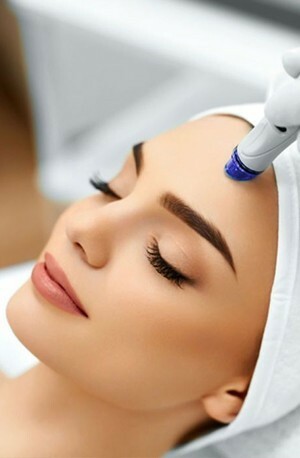 Microdermabrasion can be used for – Skin rejuvenation, Hyperkeratosis, Sun light and age damaged skin, pigmentation disorders, uneven skin, Stretch Marks and scars. The Procedure – Generally, a session of microdermabrasion of the face takes approximately 30-45 minutes. It is not painful and it may feel like you are having a facial. WHY METAMORPHOSIS CLINIC FOR MDA/SKIN POLISHING PROCEDURE? We at Metamorphosis Clinic use the safest and sterilised crystals; the procedure is done under complete medical guidance. Skin polishing procedure can be combined with all treatments possible such as Peels, Jet Facial,Rubber Masks, Photofacial, Dermal Fillers to give a Cumulative result. WHAT IS PHOTO REJUVINATION THERAPY? Photo rejuvenation is using a mechanical light source to create controlled damage to the skin, thereby forcing it to renew and rejuvenate itself. At Metamorphosis clinics we use Intense Pulsed Light (IPL) to achieve this. Our Medical practitioner will discuss your treatment plan and desires with you to determine the method used. WHAT CAN PHOTO REJUVINATION ACHIEVE ? Photo rejuvenation can help with the removal of skin blemishes, including broken capillaries, sunspots, age spots and uneven skin tone, as well as the synthesis of new collagen and elastin. It is also a great treatment to help with generalized ageing appearance like crepey skin, fine lines, wrinkles and pigmentation. HOW DOES THE PHOTOREJUVENATION THERAPY WORK? The energy of the intense pulsed light is absorbed by the therapy target. In case of spider veins the energy is absorbed by the veins and in case of brown freckles the target is melanin, destroying by heating the photoageing points. HOW LONG THE TREATMENT SHOULD LAST FOR ? Typically Photofacial takes 30-60 minutes depending upon the size of the treatment area that needs to be treated. For optimum results, a series of treatments will be performed at four to six weekly intervals. Depending on your exposure to the sun and your particular aging process and skin care regime your results could remain for up to 12 months. WHICH AREAS CAN BE TREATED ? Popular areas of treatment include Face , Neck , Bust, Hands & Arms . FotoFacials are safe for any part of the body. Face and Neck Rejuvenation Treatment – ₹4999.